In a playing out of a worst nightmare, my father was seriously ill. It seemed unbelievable that the nucleus of my existence, someone who was continuously concerned about the food I ate, if I was warm enough, whether I would bump my head if a certain window was open, or I had enough money in my wallet — concerns that oddly and fittingly, no other person had ever expressed — was too sick to even talk to me. Delhi’s deadly particulate-loaded air had dealt a disturbing blow to its cheerful citizen. Apart from heart trouble and diabetes, my father, like scores of new patients in Delhi’s sickly air, had suddenly been diagnosed with asthma. One thing led to another, as they often do when you never want them. His congested lungs were weakening his heart, and soon he was too ill for anything but surgery, painfully passing the time, not speaking, not sleeping, doing nothing but smiling wanly. Outside the hospital window though, something caught my attention. Outside the hospital window though, something caught my attention. It was a towering, stately Semal tree, framed by central Delhi’s Metro line. The straight-backed tree was oddly countered by its blossoms — they were large, gaudy, simple, brilliantly red. 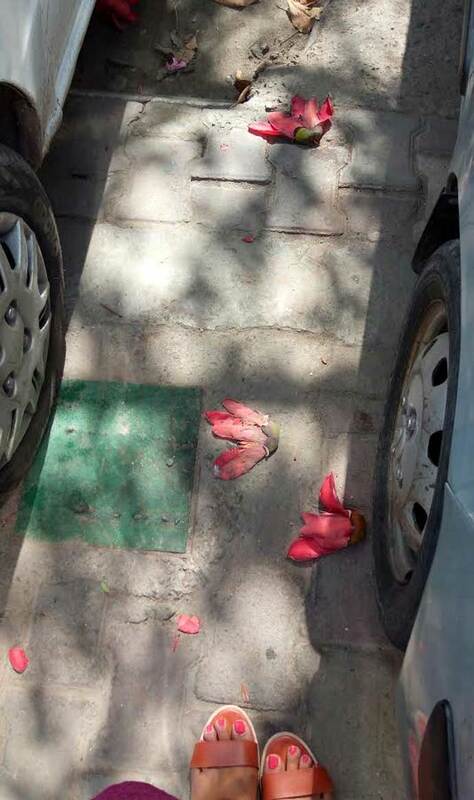 The Semal flower bursts forward in spring, splotching the skyline with impossibly bright hues, showering itself heavily and generously on cars, thela-walas, parking lots, and unknowing passers-by. The Semal flower bursts forward in spring, splotching the skyline with impossibly bright hues. The sun was just going down. The leafless tree revealed a black kite nest high amidst its branches, as if holding up a heart. The kite was wheeling in the sky, and it slowly but surely came back to the tree. A flock of starlings crossed the sky. The day was struggling, with its angiographies, CAT scans and human losses inside the four walls of the hospital, but outside, it was a different story. Spring season has been greatly canonised in Western literature. Wordsworth wrote of the earth aflame with molten-yellow golden daffodils; others wax eloquent on the first song of the Robin, the first two leaves of a sapling pushing through frost, the first thawing of ice. As spring arrives, people in cold countries start cycling again without slipping on frozen streets, tanning lotions come out, stringy clothes are slowly moved up the closet and woollen clothes packed off with mothballs. In India, monsoon holds pride of place, but spring is certainly underrated. Is it because winter is not that harsh all over the peninsula, or that the few days of spring pass too soon into a sultry, breathless summer? Whatever maybe the case, the Indian spring is a sight to behold, and worth paying attention to. In Delhi’s horticultured streets, spring is fragile but vivid petunias on NDMC roundabouts, the throwing open of the magnificent, sweeping Mughal gardens, and the ability to walk distances without collapsing from dehydration. It’s a few days really, squeezed in between nippy February and windy March. But those few days, across India, hold many wonders. 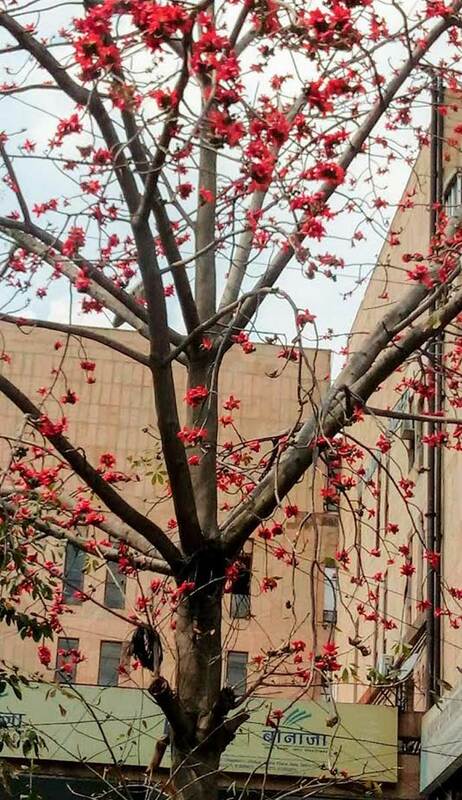 In Delhi’s horticultured streets, spring is fragile but vivid. The wild, unmanicured, un-gardened spring of India has its own colours and its own language. In Delhi, it’s the Semal that heralds the season. Semal blossoms pop out of tall, handsome tree, and are often a cool coral orange, or a lush tomato red. The large, distinctive flower seems to underscore the beauty of simplicity. The petals are simple, adorning a round, busy centre which is loved by birds. If the blossoms are like a favourite shade of rich lip colour, the cotton the tree gives is even more luxurious. The Semal yields pods of silken cotton that make for the most decadent of pillows. My maths classes in school on Pusa Road were often interrupted by the magical vista of Semal cotton which had broken off its tree and had floated into the classroom; struggling with the number line and square roots, the single cotton pod seemed much more charmed than anything I could learn out of a bound textbook. In the heart of the pods are black seeds, the result of months of effort by the tree. My maths classes in school on Pusa Road were often interrupted by the magical vista of Semal cotton which had broken off its tree and had floated into the classroom; struggling with the number line and square roots, the single cotton pod seemed much more charmed than anything I could learn out of a bound textbook. 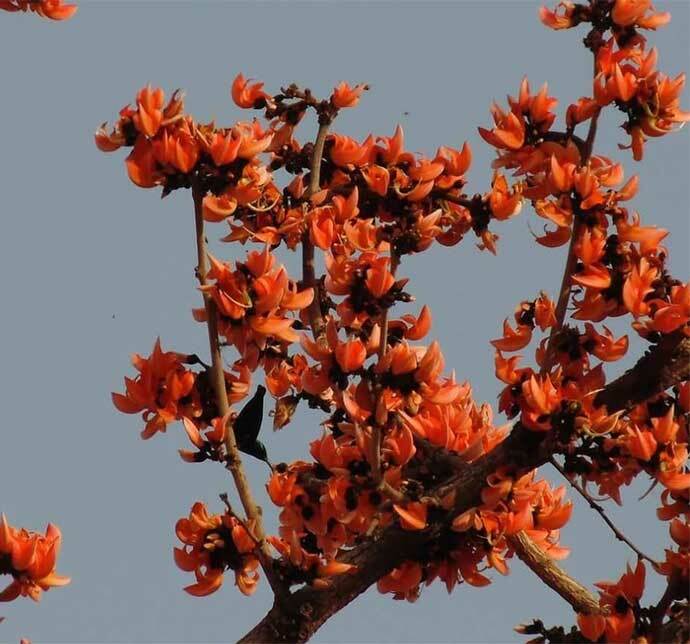 Around spring, the medium-sized Kachnar tree also offers its blossoms. The delicate flowers look somewhat like orchids. They have little patterns and the design of the complex petals is copied by many a diamond pendant maker. Kachnar is less obvious than Semal, it is like a pearl necklace which could be staple of your wardrobe, much loved, reliable in its beauty, and a shining knockout as you draw closer. And the superstar of the Indian spring has to be the Flame of the Forest. If a visit to India’s forests to catch a glance of our wildlife is like watching a minute-long trailer, this tree is the full feature film. A Flame of the Forest in blossom is a magnet for birds, bees and the searching human eye. The flame of the forest or the Palash tree, heralding spring. As the name suggests, the tree’s flowers seem to torch forests with its brilliant colour — a flaming, wet orange. As the name suggests, the tree’s flowers seem to torch forests with its brilliant colour — a flaming, wet orange. Very helpfully, the tree does not have leaves in this season. All you see are the branches laden with flowers, masses upon masses of crayon colour, crazily upstaging everything else in the vicinity. This spring, having spent an hour under this tree, also known as the Palash, for three days in a row in Central India’s Pench forests, I felt like I was in the middle of the Planet Earth documentary shooting. On the glistening orange blooms, bees buzzed in and out. An iridescent purple sunbird came with his mate, sipping nectar like a delicate pirouetting ballerina. Mynahs chattered from the branches, rose-ringed parakeets screeched in and flew out, and a busy woodpecker looked for insects. A hornbill visited, a tree-pie called, barbets flew in and out. The tree, visible from a half a mile away, was like a showreel of life itself. I wonder what would have happened to my spirits if I had not seen that gaudy Semal tree outside the hospital. Surely, both my father and I would get by. But the grey of the walls would seem greyer, life a bit more of a drudge, the cardiac complications more of an entanglement, a greater burden to bear. The defiance of a flower presents exactly what spring means — a shaking off of coldness and numbness. But the tree, and its flowers, seemed to imperceptibly change things and uplift our mood. 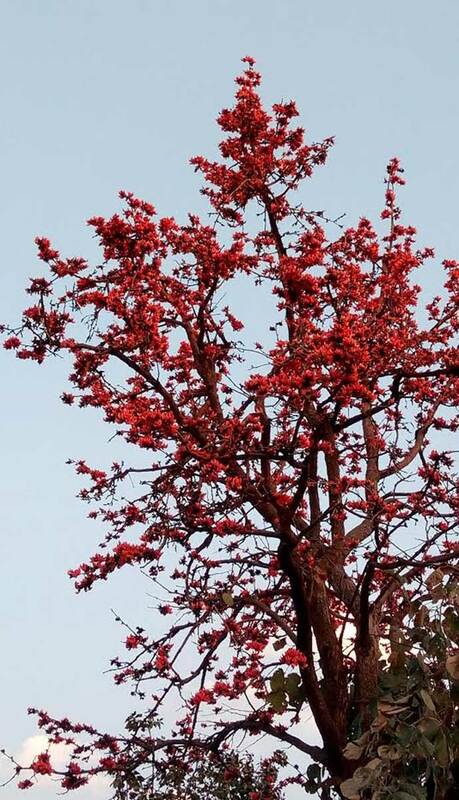 The birds on the Semal’s branches pulled of capers characteristic to their species, while the tree itself seemed to fling its cheerful redness at the ungrateful air of Delhi. It is like the Semal’s blossoms were sticking out a rather red tongue to the drudgery and easy cynicism of Delhi. It was a defiance, a defiance of beauty. It is like the Semal’s blossoms were sticking out a rather red tongue to the drudgery and easy cynicism of Delhi. It was a defiance, a defiance of beauty. And the defiance of a flower presents exactly what spring means — a shaking off of coldness and numbness, and a rebellious bursting forward of life. Flowers have soft faces, but long roots, determination and spines of steel. They embody the battle of life, and winning against concrete, particulate pollution, and disenchantment. The Indian spring, short while it may be, is florid and holding forth its very own sovereignty — as our angiographies carry on, somewhere also, a vivid flower is blooming. As our angiographies carry on, somewhere also, a vivid flower is blooming.